Goat cheeses make up a diverse and intriguing family. The only common feature of the varied cheeses in this group is that they are all made from goat's milk. With standard production methods, goat's milk yields a whiter, firmer product than cow's or ewe's milk cheeses. Traditional cylinder and pyramid shapes are reserved for goat cheeses. Nanny goats only produce milk for eight months; accordingly, farmhouse chevres are made from March to November, after kids are born in late winter. Goats are milked twice a day; the evening milking is higher in fat than the morning milking. Both are mixed together to create a more homogenous milk from which to make goat cheeses. 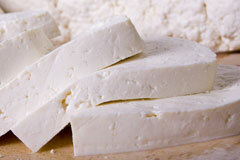 Traditional goat cheeses are then fermented either naturally, or with the addition of rennet or lactic ferments. They are then drained, dried, and salted before transfer to a cellar for ripening. Goat's milk cheeses are not ripened for long, usually only one to five weeks. After one to two weeks, the cheese becomes firm and somewhat sharp. By five weeks, the cheese becomes piquant and brittle. There are variations on this theme. A cheese made only from goat's milk is called pur chevre. Mi-chevre ("half-goat") cheeses are also sold, which are made from half cow's milk and half goat's milk. Some chevres are wrapped in leaves, herbs, or even bacon. They may be served over salad, in pasta, or with crackers or toast. 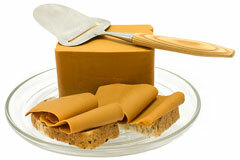 Norwegian gjetost (literally translated "goat cheese") has a unique caramel flavor and color. It owes its unusual character to a different production method: milk, cream, and whey are boiled, caramelizing the lactose and yielding the unique sweet flavor of this cheese. Chavrie, America's first goat cheese, is still produced in Lancaster county, Pennsylvania. Most of their goat milk comes from local Amish farms. Pure Luck Farm & Dairy produces a variety of artisanal goat cheeses, including bleu cheese, fresh chevres, and soft ripened cheeses. Vermont Butter & Cheese Creamery crafts artisanal dairy products from cow's milk and goat's milk in the European style.